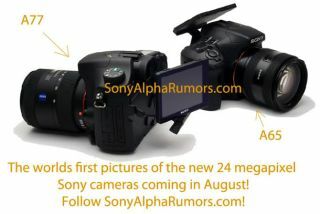 The Sony A77 and Sony A65 are expected to be announced in August. Sony may soon announce the launch of new Alpha 77 and Alpha 65 DSLRs, according to new images of the Sony cameras posted online. The Sony Alpha Rumors blog has obtained images of production models of the Sony A77 and Sony A65 from a souce who claims the Sony DSLRs will be announced in August. The source claims a Sony announcement was originally planned for July, but was pushed back following the earthquake and tsunami in Japan. This would seem to confirm what we reported earlier this year when an announcement on Sony's Japanese website hinted at the launch of a Sony A700 replacement at 'mid-year'. The blog reports the Sony A77 will be Sony's new top APS-C DSLR and replace the Alpha 700. The source claims its specs will include an ISO range from 100 up to 102,400. The Sony A77 is also said to use a new double Bionz processor, boast a 3-million-dot OLED EVF and shoot more than 10fps, with 11 cross AF points. Less is known about the Sony A65, but it is expected to use Sony's translucent mirror technology. Earlier this year our colleagues at PhotoRadar reported that all future Sony Alpha cameras would feature translucent mirror technology.